Two little kids from Epworth, Great Britain, have been blessed with what is the coolest middle name ever. You know the old expression, “Danger is my middle name,” that spies and action heroes use? Well, Danger is their middle name, for real. 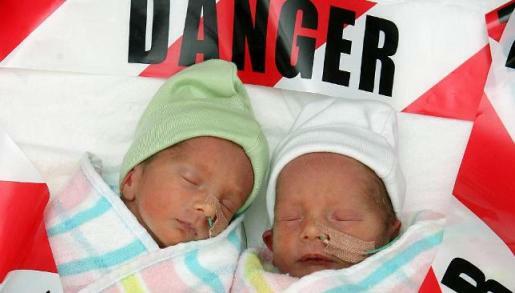 Billie Danger Lampard and Ridley Danger Lampard were born 6 weeks early at Epworth’s Freemasons Hospital, but are otherwise healthy and happy. And, of course, blessed with an awesome middle name and the instantly cool nickname of the Danger Twins. Said proud parents Glenn and Amy Lampard, “We’re actually enjoying calling them the ‘Danger Twins’ at the moment. It’s a bit of a novelty.” The reaction has been mixed from friends and family, but honestly; you don’t get much cooler than the Danger Twins. It’s a cool name; distinctive, but without much criminal overtone and not confusingly spelled. Props to the parents for their willingness to have some fun with what is essentially a useless secondary identification. They don’t look dangerous now, but hopefully they’ll grow into it. With great name comes great responsibility.